Portland International Airport Your car can pay for your parking space. Portland International Airport : Are you a traveler looking for value for your money? TravelCar has the best parking deals for travelers moving in and out of Portland International Airport (PDX). Our car parking package consists of covered parking lots, car servicing, car detailing, tire changing, oil checking, and general car wash.
Portland International Airport (PDX) was built in the year 1926 in Portland, Oregon. The airport is located 19 kilometers North-East of Downtown Portland. The airport is a principal hub for Horizon Air, Alaska Airlines, and Ameriflight. The Port of Portland owns and operates the airport. Portland International Airport serves the Oregon-Washington Metropolitan Statistical Area and the Vancouver-Portland-Beaverton Area. Portland International Airport is the largest international airport in the State of Oregon. It handles both commercial and military aircraft operations. As of 2017, the airport had facilitated 228,949 aircraft operations and 19,080,454 passenger enplanements. Portland International Airport is the busiest among other major airports in Oregon. The other airports include Eugene Airport, Rogue Valley International-Medford Airport, Southwest Oregon Regional Airport, Redmond Municipal Airport, and Klamath Falls Airport. Portland International Airport offers direct flights to major airports in the United States. The airport facilitates non-stop international flights to the United Kingdom, Canada, the Netherlands, Germany, Japan, Iceland, and Mexico. PDX is the 30th busiest airport in the United States of America. TravelCar is present in all of the above cities and major airports. We also ensure you are awarded the best parking deals upon subscription on our website at www.travelcar.com. Get a ride of your choice and explore cities neighboring Portland International Airport. 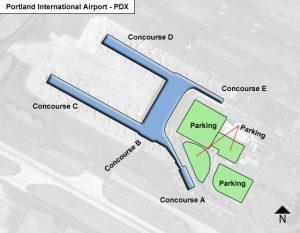 Portland International Airport has parking spaces for both short and long periods. The short-term garage is located adjacent to the main terminal. This garage has electric charging stations at Level 2 on the fourth floor of the short-term parking garage. The Economy Parking Lot is based on the N.E Airport Way. Electric charging stations at the Economy Lot are situated at Level 1 of the garage. The Cell Phone Lot is available for driving picking up their clients. Motorcycles and bicycles enjoy free parking at the arrival level of the airport within stipulated timelines. Bicycle parking is also allowed on the upper level of the terminal building. Because we care about your budget and need to save cash when traveling, TravelCar offers you the best parking deals. In Portland International Airport and its environs, we have the most affordable parking prices compared to other firms. We are very close to the airport terminals. We offer a free shuttle service to the gates of the airport to save you the burden of carrying luggage. Our shuttles are easy to access even for disabled individuals. They frequently leave to the airport terminals. Parking is cheaper when you book early on our official website www.travelcar.com. You stand to get discounts of up to 70 percent on parking prices depending on your location. Get the best parking deals now while the offer stands. You can access our services at all major airports, seaports, train stations and city downtowns. You are free to confirm with us our presence on any other location. Call us up on +1 888-807-0209, and we will advise further. Some of the relevant business districts in Oregon include Downtown Portland, Lloyd District, South Waterfront area, Old Town Chinatown, Southwest Hills, Goose Hollow, Pearl District, River Place, and Marquam Hill. You can access the best parking deals from TravelCar at all these districts. 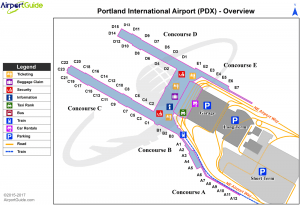 Portland International Airport has two passenger terminals connected by a Concourse Connector. There are 60 gates. TravelCar Rentals and Ride-sharing company sees beyond just traveling. The company understands how important it is to a traveler to acquire the best parking deals in an airport, a city, a cruise port or a train station. At all these points, a traveler needs a car and a parking space. At TravelCar we offer both car rentals and avail parking slots to our clients. As long as you have subscribed to our website at www.travelcar.com, you can be assured to get a parking slot from us regardless of which city you are in Oregon. Do not get stranded if you are moving in a group of family or friends. We got your back! Get a car rental that will accommodate all the members of your group. Choose a TravelCar rental automobile and be comfortable. Our clients can request a vehicle from the vast variety of automobiles at our disposal. Choose a vehicle that will augur well with your occasion, fuel budget, passenger number and luggage type. Have very young kids? Choose a vehicle with a baby car seat. We have an awesome parking arrangement; if you suspect you may be away for an extended period, and you came with your vehicle, you can lease it to TravelCar! Yes, it is very much possible to earn money when you leave your car for long-term parking. Let your car earn money for you. Your money will be dependent on the amount of time you leave your car with us. Your automobile will be used by other travelers coming into Portland International Airport. Our parking lots are very desirable as we offer the best parking deals. We are mostly located offsite. This, however, is not a hindrance to timely access to the airport terminals. With our frequent shuttles, it only takes about five minutes to get to your gate of departure. We value the security of your vehicle and therefore, we secure our parking lots with gates and deploy security guards to man the area. Additionally, there is 24-hour CCTV surveillance to keep track of activities in the parking areas. Portland International Airport has passenger traffic both day and night. We are also available day and night to make sure you are not stranded at the airport because of lack of transport or parking. On top of the parking deals, we have an amazing valet team to help with professional parking of your vehicle. Our customer service team is always standby to receive your requests and inquiries on the booking process. Valet service is an icing on a cake to a traveler who does not need a parking headache. Parking can get tedious when there is high passenger traffic at the airport. We have attractive valet prices, very pocket-friendly. Our valet team is courteous and very easy to talk to amongst other great attributes. The valets are entirely conversant with a variety of automobiles, so you leave your car in safe hands. For bookings, log on to our website www.travelcar.com, have a chat with our agent on live chat. Our agent will guide you on the parking prices depending on your location. You will also be advised on valet prices and car rentals as per your needs. Quotes are available online upon request. Remember that we have the best parking deals for your automobile. Portland International Airport is famous for mass transit of passengers to the city of Portland. Portland International Airport is mainly served by Interstate 205.